To those who knew Pauline Thesmacher only by reputation, it may have come as a surprise to learn that the woman who was described as “one of the foremost voice teachers of our time” intended originally to be an instrumental performer on the concert stage. In 1928, when she enrolled at the Cleveland Institute of Music (CIM), her dream was to one day become famous as a pianist. After two years of study, she realized that her true talent lay elsewhere, so she changed her major to voice—a course alteration that would prove most fortuitous for the hundreds of students who in later years would come to know her as teacher, tutor, role model and mentor. The mantle of “legend” hung lightly on the shoulders of Thesmacher, whose career as an educator spanned eight decades. In that time she shaped the talents of an extraordinary number of young people, many of whom later achieved national and international stature, both as performers and as teachers. Generations of her students have served as choral directors, college and university professors and public school music teachers around the country. Thesmacher's pedagogical career began after she graduated from CIM in 1934. That year she became an assistant in the private teaching studio of one of her former voice instructors, Marcel Salzinger. Later in the decade she continued her studies at the Berlin Conservatory of Music, and in the early 1940s she received further training from the composer and Juilliard School faculty member Sergius Kagen. Kagen's commonsense approach to voice instruction stressed the legato style of smooth and even phrasing, a method that Thesmacher would eventually adopt as her own. Thesmacher taught at the Cleveland Music School Settlement from 1962 to 1985, serving as head of the voice department for 14 of those 23 years. At the same time she conducted classes at the former Koch School, which eventually became part of Lakewood, Ohio's Beck Center for the Performing Arts. Perhaps her most singular teaching experience occurred in the 1950s, when she was a volunteer coach in the opera theater of Cleveland's Karamu House. It was there that she was introduced to a young would-be tenor named Seth McCoy. Recently arrived in Cleveland from his native North Carolina and entombed in a job at the local post office, McCoy had been encouraged by a friend to audition at Karamu. Thesmacher immediately recognized his talent and took him under her wing, providing private lessons three times a week for the next seven years. As a result, by 1963 McCoy was a soloist with the Robert Shaw Chorale, and he went on to become the leading oratorio tenor in the U.S. for more than a decade, performing with the New York Philharmonic, the Chicago Symphony Orchestra and numerous other major ensembles around the world. In 1979, he made his debut at the Metropolitan Opera—one of the highlights of his career and one of the high points of his former teacher's life. The celebrated tenor was professor of voice at the Eastman School of Music in Rochester, New York, when he died in 1997. Sharing his talent and experience with those who hoped to follow in his footsteps, McCoy was emulating the remarkable educator who so many years before had nurtured his own gift. 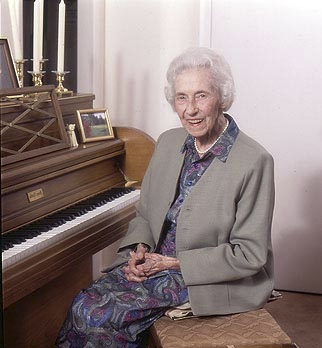 Like all of Pauline Thesmacher's former pupils who have spread out across this community and the country to pursue careers as noted performing artists or teachers of voice at prestigious institutes and universities, McCoy was, in a sense, an extension of the woman herself. Which is why Thesmacher's wisdom and guidance will continue to influence students of voice for generations to come.